Accepted Scientific Name: Mammillaria bocasana subs. eschauzieri (J.M.Coult.) W.A.Fitz Maur. & B.Fitz Maur. Habitat: Grows along with Myrtillocactus geometrizans, Ferocactus histrix, Echinocereus cinerascens and Agave salmiana. 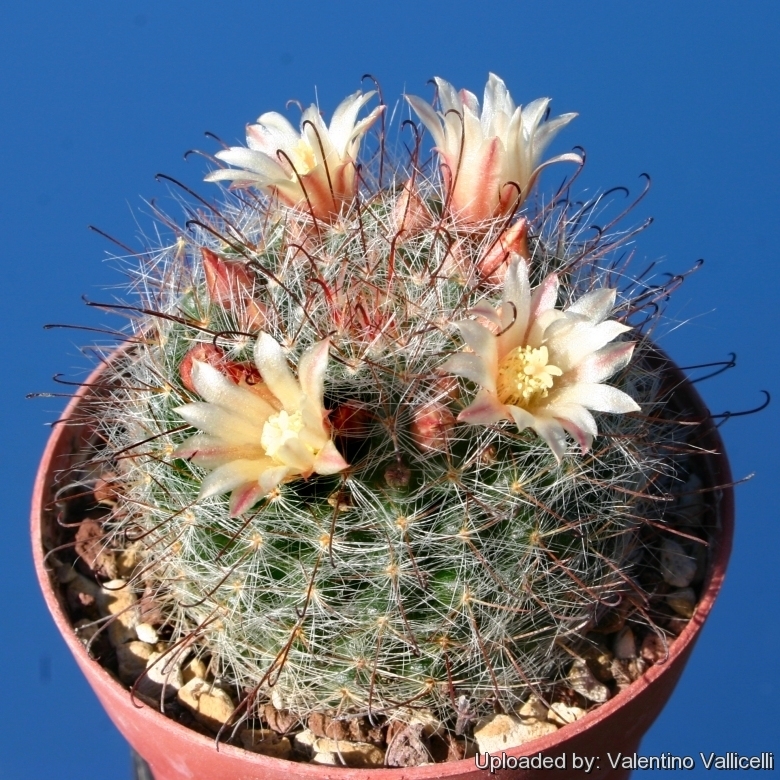 Description: Mammillaria knebeliana is one of the many geographical form of Mammillaria bocasana. Many of its morphological and geographical variant was early classified as different independent species, but nowadays all this plant are considered part of a multiform species, where each form is linked to others by populations of plants with intermediate characteristics. Mammillaria knebeliana has distinctive pale creamy-yellow flowers with a reddish tint in outer tepals. Central spines are dark brown and contrast nicely with the silky white radials. Mammillaria knebeliana is often referred to Mammillaria bocasana ssp eschauzieri, but its true classification is still controversial and Reppenhagen placed this plant as a synonym of Mammillaria crinitaall of which goes to show just how confused the naming of this plant has been. Habit: It is a low growing clumping cactus, often forming large mounds. Stems: Individual stems spherical, sometimes becoming somewhat cylindrical. light green to bluish-green, 5-8 cm tall and 3-6 cm in diameter. Tubercles: Slender, soft, cylindrical, terete. Without latex. Radial spines: 20-30, white, hair-like, silky, 8-20 mm long. Central spines: Reddish brown, 5-10 mm long, of which one (occasionally two) hooked, brown, but paler at base. Flower: Funnel-form, creamy-white, creamy-yellow with a reddish tint in outer tepals; perianth-segments lanceolate-linear, acute, spreading. Flower-buds rose-coloured. Fruits: Cylindrical, rosy-pink to red, 2,5 cm long in summer. Cultivation and Propagation: Mammillaria knebeliana is a freely clustering species that reproduces easily by cutting. 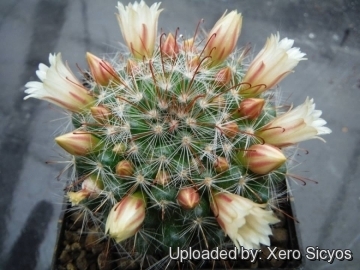 It is a great starter plant for the cactus grower, that readily builds up into a dense cluster of stems smothered by white hairs, further decorated by rings of cream or pale pink blooms.